Joseph Hodge, left, will be guest conductor, and Wesley Baldwin, right, will be cello soloist at the opening concert Saturday night of the Manchester Symphony Orchestra’s 54th season. The Manchester Symphony Orchestra’s concert on Saturday, Nov. 2, at Timothy Edwards Middle School in South Windsor, titled “New Beginnings,” starts a new season with a new orchestra conductor, and, for some additional variety, a performance in South Windsor. As fresh autumn breezes begin to blow, MSOC’s members are thinking back to last year’s opening concert, held just as those winds were racing up the coast as Superstorm Sandy. The impending storm added to the sense of anticipation as the orchestra gave its first performance under the baton of guest conductor Joseph Hodge in a program including Tchaikovsky’s rousing 1812 Overture. A year later, Hodge is now the orchestra’s music director, and the major work on this season’s first concert is, once again, Tchaikovsky. “Tchaikovsky has a flair for drama that has always attracted me to his music,” said Hodge. Manchester’s symphony orchestra will be heading to a new destination in South Windsor for this concert, but it’s a short trip compared to the journey of the soloist for this concert, Wesley Baldwin. 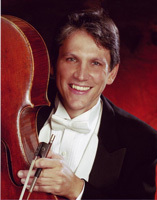 Baldwin is traveling all the way from Tennessee, where, in addition to his career as a cellist, he is a full professor in the School of Music at the University of Tennessee, conductor of the Knoxville Youth Chamber Orchestra, and founder and director of the Tennessee Cello Workshop. MSOC is arranging opportunities for local music students to benefit from Baldwin’s expertise as musician and music educator. There are plans for master classes in South Windsor and at Manchester High School, where MSOC is artist-in-residence. For the concert, Baldwin will perform Lalo’s Concerto in D minor for cello. This work is a particular MSOC favorite, most recently performed by the orchestra in 2009. True to its title, “New Beginnings” also includes music that’s relatively new to the classical repertoire. Lyric for Strings was composed by George Walker in 1946, after the death of his grandmother. “This is some of the most gorgeous and accessible music out there,” he said. “It recalls tones of Barber’s Adagio for Strings, with a somber quality and an intense climax, and you can really hear the beauty and pain Walker felt when writing this,” Hodge said. “New Beginnings” will be performed at 7:30 p.m. Timothy Edwards Middle School is at 100 Arnold Way, South Windsor. Tickets can be purchased at the door. Prices are $18; $15 for seniors and students, and free for those younger than 18.